Food & Events Blogger: where to go, what to make and things to try! INTRODUCING: London’s Street Food Vendor of The Year, Fins & Trotters! When the fight is on and it’s time to separate the winners from the losers, there’s only one thing for it: take it to the streets. If you can’t win at street level, before a hard-working crowd-turned-judge-and-jury, you’ll never know what you’re truly made of. Against a backdrop of food markets and festivals, where organisers and vendors vie for the appetites of hungry Londoners in an epic clash for supremacy, a victor has finally emerged from the scrum: Fins and Trotters Kitchen Restaurant. Voted Street Food Vendor of the Year at the 2013 London Lifestyle Awards, the mobile stall is a regular fixture at Shepherds Markets’ sites across the Capital, dishing up traditional Fish and Chips. The humble stall was up against renowned traders from some of the UK’s best-loved street food gatherings, making the win, decided by public vote, an exceptional honour. Of course, the accolade comes as no surprise to those who have already sampled a portion of Fins and Trotters’ crispy-battered cod and chips. The dish is, quite simply, “a winner”. 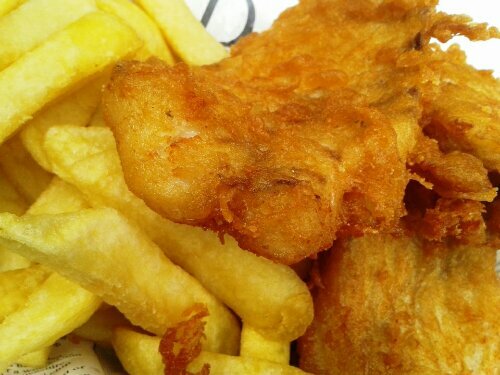 The fresh fish fillets are purchased each morning, and coated in an old-fashioned, seasoned batter to be deep-fried to just the right crispness! Paired with a generous portion of thick-cut chips, servings sell out fast! 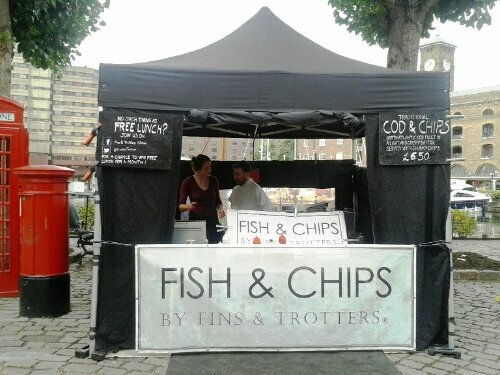 Head to the Piccadilly Food Market, Jermyn Street Side, every Monday between 11am and 3pm, and the St Katharine Docks Good Food Market, every Friday from 11am to 3pm to sample Fins and Trotters’ award-winning, delicious Fish and Chips – officially London’s best street food dish! Christmas shoppers will also find the stall at the More London Christmas Market on Thursday 12th December, from 11am to 6pm, at More London, More London Riverside, London, SE1 2DB. That Fish and Chips looks absolutely AMAZING!!!!! I’ll have to pay them a visit next week.